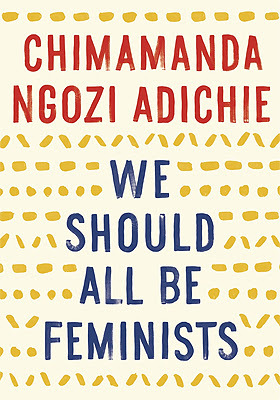 We Should All Be Feminists by Chimamanda Ngozi Adichie is a short book that is 52 pages in length. It's a nonfiction essay dealing with the specific topic of feminism. I was able to read this book in one sitting! I've been wanting to read We Should All Be Feminists by Chimamanda Ngozi Adichie for quite awhile and had planned to read it next month for Women's History Month. However, I simply couldn't wait to read it sooner rather than later... I'm glad that I decided to read We Should All Be Feminists by Chimamanda Ngozi Adichie earlier than anticipated. Although I thoroughly enjoyed reading We Should All Be Feminists by Chimamanda Ngozi Adichie, I felt like several ideas discussed in Adichie's book, were ideas I was already familiar with through reading other feminist texts. However, that doesn't mean that I didn't learn anything new at all or that I didn't enjoy the powerful message contained between it's covers. What I enjoyed most about reading We Should All Be Feminists by Chimamanda Ngozi Adichie is that it is very readable, yet contains a very powerful, straightforward message about the importance of being a feminist. Chimamanda Ngozi Adichie also makes a great case on why it is important to begin raising our children differently without the usual gender stereotypes/biases. I think We Should All Be Feminists by Chimamanda Ngozi Adichie should be read by everyone, men and women alike. We all have the power to change our views and outlook to make the world a better, more inclusive place for all. I am giving We Should All Be Feminists by Chimamanda Ngozi Adichie a rating of 4 stars out 5 stars. I saw her give this live, though on video. I think it was maybe a TED talk. I agree with all you say. Until I actually read We Should All Be Feminists, I didn't realize it was a Ted Talk.